Dramm has improved it's easy-to-use Hydra Sprayer. Dramm has redesigned the cart and tank replacing the 45 gallon tank with a 50 gallon tank. The new 50 gallon tank has an improved sump well that ensures proper draining of the tank. Additionally, the 50 gallon size makes mixing calculations easier. 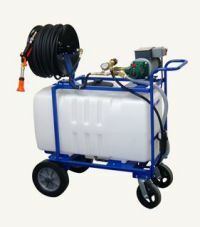 easy-to-use Hydra sprayer or any other Dramm products please email us or contact us on the numbers to the left.